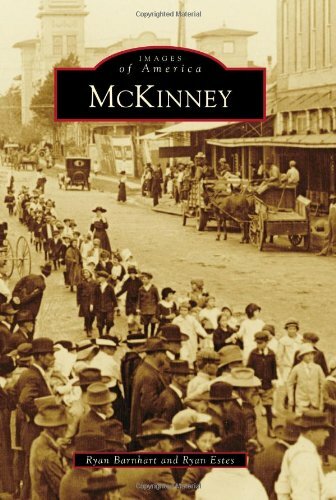 McKinney s very first settlers began arriving from Kentucky, Arkansas, and Tennessee in the early 1840s. Collin County was created by the Texas legislature on April 3, 1846, and due to a provision violation requiring the county seat to be within 3 miles of the center of the county, McKinney replaced Buckner as the seat in 1848. The vote deciding the new seat, however, went in McKinney s favor primarily because flooding kept many citizens from casting ballots. On March 16, 1848, the state legislature passed an act to name the new town in honor of Collin McKinney, one of five original draftees of the Texas Declaration of Independence. Today McKinney is one of America s fastest growing cities and has seen a population boom from approximately 16,000 residents in 1985 to more than 120,000 in 2010." Author Ryan Barnhart, an English teacher at Liberty Christian School, partnered with historian Ryan Estes, a Texas history teacher at McKinney s Evans Middle School, to compile this impressive photographic history of McKinney s past. Using images from the Chestnut Square Organization s archives, the book also features photographs from private collections, including those of Ridgell McKinney, the great-great grandson of Collin McKinney. Proceeds from sales of the book benefit the Chestnut Square Organization.